In the new strategic plan for the development of tourism for the period 2013-2020, unveiled recently by the ministry of tourism, culture, youth and sports, tourism minister Aldo Bumci highlighted developing mountain tourism, improving the quality of tourist services and the expertise of human resources, and promotion of Albanian tourist sites abroad. A tightly closed country with one of the most rigid Communist regimes until 20 years ago, now Albania has opened its borders to foreign tourists – firstly to its Adriatic and Ionian coasts. After 1945, the Adriatik Hotel in the coastal city of Durres accommodated foreign tourists predominantly from communist countries. Foreign tourism was not among Albania’s priorities under the 41-year rule of the country’s Communist leader Enver Hoxha. The country’s roads were narrow and poorly marked and private ownership of automobiles was prohibited. Since the fall of Communism, visiting restrictions were relaxed and Albania’s sea coast experienced a spontaneous and often uncontrolled rise in construction. Since mid-nineties the number of overnights in Albanian hotels and the number of foreign tourists, visiting the country, has increased. Major roads were reconstructed and upgraded and new ones were built in the first decade of the 21st century. The aims of Albania’s tourism development strategy drafted back in 2003 include creation of central-level and local structures that will ensure the implementation of strategic plans and objectives; preparation or review of existing urban plans of tourism development priority areas based on a comprehensive economic, social-cultural, and environmental analyses; development of infrastructure; prior development of accommodation structures of medium capacity of 60-70 rooms in coastal areas; property issues clarification; human resources education; rise of funding; promotion of tourism; development of telecommunication and Internet. In 2011, 2.7 million foreign visitors travelled to Albania, 430,751 more than in 2010. Out of the total, 77,451 were German nationals or 39% more than a year earlier and 76,604 were British, a rise of 23% over 2010. Visitors from Greece increased by 34% from 2010 to 151,256, there were 30,620 visitors from France or 19% more than in 2010, and guests from Switzerland, where a large Albanian diaspora lives, increased by 46% to 32,604. In 2011, the greatest numbers of foreign visitors were recorded in July and August (670,713 and 684,886 respectively) and the smallest ones – in January and February (90,712 and 79,189), which clearly indicates that Albania is still predominantly a summer holiday destination. Nearly half of all foreign visitors in Albania (46%) last year came from Kosovo, followed by citizens of Macedonia (12%). This is no surprise, as ethnic Albanians account for over 90% and over 25% of the population of Kosovo and Macedonia, respectively. Montenegro, Turkey and Croatia are among Albania’s main competitors in attracting tourists from Kosovo and Albania during the summer months. Montenegro and Greece followed with 6% each of all tourists that visited Albania last year, Italians (5%) Brits and Germans (3%). As part of its efforts to attract tourists from the vast and largely untapped Russian market, Albanian authorities cancelled entry visas for Russian citizens during the summer months of each of the last four years. In the rest of these four years Albania applied relaxed visa issuance procedures for Russian nationals. 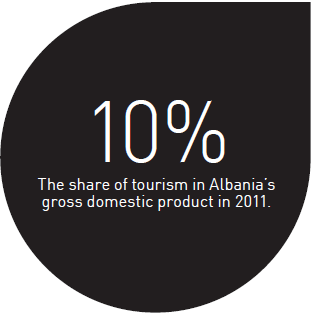 In 2011, 2.7 million foreign visitors travelled to Albania, 430,751 more than in 2010. Out of the total, 77,451 were German nationals or 39% more than a year earlier and 76,604 were British, a rise of 23% over 2010. Albania, a country of 28,748 square kilometres with a population of 2.8 million, has a mild Mediterranean climate along its coast and a moderate climate in its eastern parts. It has nearly 450 kilometres of coast line, with the Adriatic Sea lying from the border with Montenegro south to the Bay of Vlora, where the Ionian Sea begins. The Mediterranean climate of the seacoast provides for a long summer holiday season. The mainly sandy beaches on the Adriatic Sea coast and the predominantly rocky beaches on the Ionian Sea coast attract visitors from May until the beginning of autumn. Being mostly a mountainous country, Albania also offers ample opportunities for the development of mountain tourism. The Albanian Alps, in the north of the country, currently are one of the most popular tourist destinations for visitors from western and central Europe thanks to their pristine natural beauty. Rafting, fishing and hiking are among mountain sports offered to domestic and foreign tourists alike. Mountain sports tourism, however, has still a long way to go to reach its full potential. 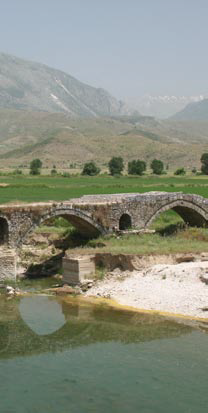 Albania can also tape its rich ancient Illyrian heritage to develop and promote cultural tourism. Illyrians, a group of tribes who inhabited part of the western Balkans in antiquity and the southeastern coasts of the Italian peninsula are seen as predecessors of modern-day Albanians. Being under the rule of the Roman and Byzantine empires, the medieval Bulgarian state, and the Ottoman Empire in different periods of its history, the territory of modern-day Albania can offer tourists a variety of historical places, fortresses, and artworks. Albania’s rich folklore can be seen during numerous folklore festivals held throughout the country. Straddling the border between Europe’s Roman Catholic West and the Orthodox East, Albania offers Christian worshippers many places of pilgrimage – old Christian Orthodox churches and monasteries in its south, and Roman Catholic ones in the north, icons and relics. The country is home to the Muslim Bektashi Order with the World Bektashi headquarters located in Tirana. Bektashi tombs (tekkes) are an object of religious pilgrimage as well. In 1967 the communist government declared Albania the first atheist country in the world and closed down all mosques, churches, monasteries, and other places of worship and either destroyed them or turned them into restaurants, cinemas, stores and sports centres. During the communist period and after its collapse no statistics on the religious structure of the population was available. According to data from the pre-communist period 70% of Albanians were Muslims, 20% professed Orthodox Christianity and 10% were Roman Catholics. With its rich Balkan cuisine with strong Mediterranean influence Albania can successfully develop culinary tourism. The Adriatic and the Ionian Seas as well as the Shkodra, Ohrid and Prespa lakes offer a variety of fish, broadly used in local dishes. Rural tourism also can be a good source of income for the country’s preserved rural areas, especially in the mountains. Challenges, however, remain at both national and regional level. The low quality of road, electricity, water supply and sewerage infrastructure, the overbuilding of the main seaside destinations like Durres and Saranda, the pollution of the seacoast, the lack of development plans for tourist spots are among the tasks the government should tackle with priority in order to promote the development of hospitality industry.